Embrace the Era of Smart Analytics | Constellation Research Inc.
Machine learning and artificial intelligence advances in five areas will ease data prep, discovery, analysis, prediction and data-driven decision making. 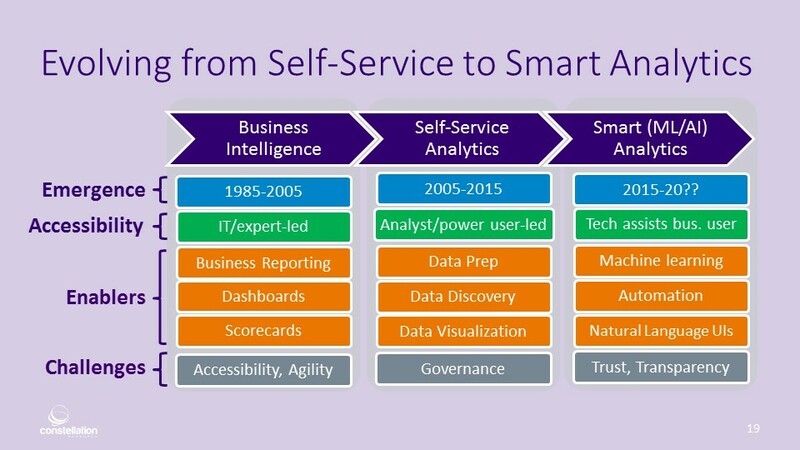 For ten years the prevailing trend in business intelligence (BI) and analytics has been the move toward self service. That’s about to change. In 2018 and beyond we’ll see a growing list of what many call “smart” capabilities powered by machine learning (ML) and artificial intelligence (AI). These features are sure to help us move beyond the limits of the self-service era. As I explain in a my latest report, “How Machine Learning & Artificial Intelligence Will Change BI & Analytics,” we’re already starting to see smart capabilities in five areas: data prep, discovery, analysis, prediction and AI-powered, prescriptive applications. My research details investments being made by more than 20 startups and 14 established BI and analytics vendors to advance the state of the art. Expect a steady drumbeat of announcements throughout 2018 and beyond about ML applied to tasks including cleansing and combining data, discovering new data, and suggesting new combinations of data that could, in turn, uncover important insights. Non-technical business users will appreciate ML-powered suggestions on best-fit data visualizations. Automated modeling features, meanwhile, will help non-technical business users tap into the power of predictive analytics. As noted, some of these capabilities are already starting to appear. My report details which capabilities are available today, those starting to appear and those we should expect in the future. For example, natural language (NL) querying based on keywords available in column headers has been with us for years. Some vendors are now using more advanced NL capabilities that can discern nuances and intent in complete sentences (whether typed or translated from voice with speech-to-text capabilities). On the cutting edge, systems are starting to retain the context of queries; instead of asking one, isolated question at a time, you’ll have a responsive dialogue with the data, drilling down and exploring from an initial query. Of course, many business users are more interested in action and outcomes than interpreting reports, dashboards and data visualization. These are the users more likely to take advantage of the growing list of smart, ML- and AI-powered prescriptive applications emerging. Here’s where the context of decisions is built into business applications for sales, marketing, HR, supply chain, logistics and more. In these cases the data analysis can be tuned to deliver recommended next steps or even to automate actions sure to lead to desired outcomes. These emerging capabilities will make BI, analytics and data-driven decision-making that much more accessible, understandable and actionable for non-technical business users, but embracing the new won’t be as easy as waving a magic wand. I’ve spoken to practitioners who were surprised and dismayed to see employees responding to ML- and AI-powered recommendations in unexpected ways. Salespeople, for example, sometimes stubbornly pursue leads deemed as less than promising by predictive scores. Here’s where change management will be crucial. As I explain in my report, delivering transparent and explainable AI that instills trust will be crucial to making smart systems succeed. Here's a link to a free excerpt of the complete 27-page report.